The frosty winter which is paralyzing many European capitals has hit Belarus hard. While public services work efficiently in the capital, many in various regions and the homeless suffer from the cold. In Minsk, the city administration has taken measures to deal with the cold weather which is exceptional even for Belarus. In the small villages, however, people often end up being cut off from the rest of the world by snow. While public life does not come to a standstill in Belarus because of the winter, it is still unusually cold. Last week, on 2 February, the country has seen the coldest day and night since the beginning of weather recording in 1917. On that day, the average temperature in Minsk was -21 °C. 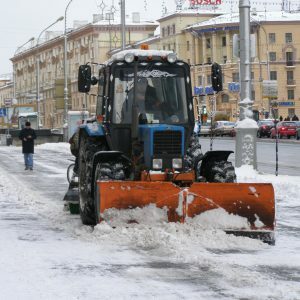 The Belarusian capital is well equipped to deal with snow and ice. In contrast to Western European cities like Rome, where the traffic stands still as soon as snow is falling, Belarus has efficient mechanisms to deal with snow. Special vehicles clean the roads and bring the snow out of town. Traditionally, the Belarusian state fights unemployment by sending people to do public works. They work in orange vests, clean streets, shovel snow, and weed flower beds. There are thousands of them, working in parks, in courtyards and on the roofs, from where they remove loads of snow and the icicles. However, the economic crisis has made itself evident this winter. For the first time, announcements at entrance doors of many houses are asking Minsk's citizens to volunteer for snow shoveling. The mayor of Minsk, Mikalai Ladutska, has repeatedly called on the residents of the capital for help. 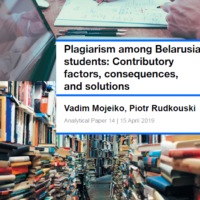 Apparently, the Belarusian state can no longer afford to employ an army of people and pay them to do work that is done by the population in most other countries. It is not surprising that there are not many people that would like to clear away 30 cm of snow from the paths of their courtyard for free. People in orange vests have been paid for by the state for years. The result of the volunteering campaign has been disappointing and the city administration came up with another idea. The Minsk city executive community, recently adopted a new directive. Apart from people registered as temporarily unemployed, students and staff of city enterprises will from now on work to help the public. Apart from this group of people, prostitutes who have been sentenced to render community service are supposed to help shoveling snow as well as some media report. For residents of Minsk, this winter means that they have to cope with a temperature difference of around 50° C between their flats and the world outside. Most flats in Minsk have central heating regulated by the city authorities. Heaters do not have thermostats. In flats it is often around 25° C. But some houses, especially recently-built are badly insulated, so it is rather cold in these flats and a draft makes it impossible to get warm after you come home from the street. The situation is especially problematic for families with small children. It is nearly impossible to take a bath in a cold flat. Young families suffer more impediments from the cold winter. Doctors recommend not going outside with little babies when it is colder than -10° C. Many people decide not to let their children go to the kindergartens because it is simply too cold to leave the house and because many kindergartens and schools are not heated. Schools, however, are closed only when temperatures drop to lower than -25° C during the day. In Minsk, an old hospital on Bahdanovich street has been transformed into a home for homeless people. It has 55 beds, and homeless people get warm clothes, tea, blankets and hot soup. The home will work until 1 April, and social workers and doctors are there to help the homeless people who come there. However, everybody who wants to find shelter there has to go through a medical examination. Outside Minsk the situation is even worse. In small villages, many houses do not have central heating. The villages are cut off from the rest of the world because the roads are not cleaned from snow. As mainly old people live in the villages, there is a risk that the people will freeze or starve to death. Caritas and other humanitarian organizations bring food and wood to some of the villages, but of course it is impossible for them to get to every village in the country. According to the website of the newspaper Nasha Niva, 129 people have suffered from frostbite this winter and 60 people died from cold. And those are only the officially recorded statistics. According to Caritas, some homeless people cannot come to the soup kitchens because they do not even have shoes. If you have a business trip to Minsk coming up in the next days, stick to our three survival hints for Belarusian winter. The weather forecast announces temperatures around -25° C for the next week. 1. Make sure you have a Belarusian friend who will lend you a fur coat (ask for shuba or dublionka) and a hat (shapka). No matter what you think, the clothes you bought in any country west of Poland are not going to keep you warm in Belarus in the winter. 2. If you are a woman: do not be vain. Put on the shapka, even if it makes a mess of your hair. You will notice that most women either have a deranged hairstyle as well, or they just leave on their shapka indoors. Otherwise your ears may suffer serious frostbite. 3. Only walk in the middle of the sidewalks, never close to the houses. Icicles may fall down and kill you- they are one of the great dangers of winter in Minsk. For this reason, signs warn pedestrians to be aware of those ice stalactites. You certainly do not want the full “Basic Instinct” experience when you are on a business trip to Belarus. Last month lawyers for Israeli Foreign Minister Avigdor Lieberman had to defend their client in court against graft charges. The charges included promotion of the former Israeli ambassador to Belarus who leaked privileged information about a police investigation against Lieberman dating back to the 1990s. In the meantime, the new Israeli ambassador began working in Belarus. Since March 2011, the Israeli diplomatic mission in Minsk had been working without its head. Minsk-Tel Aviv affairs are often murky and sometimes difficult to understand. This is not only because of close connections between the nations and cultures – many in the Israeli elite were born in Belarus – but also because private interests of top politicians often set trends in bilateral relations. The new Israeli ambassador Yosef Shagal was born in Baku in Soviet Azerbaijan. He is a professional journalist whose political career is connected with an Israeli nationalist party founded by another USSR-born Israeli – Minister of Foreign Affairs Avigdor Lieberman. Shagal’s appointment to Minsk marked the continuation of Lieberman's policy to promote Russian-speaking Israelis to ambassador positions in key post-Soviet countries. The previous Israeli envoy to Belarus Eddie Shapira left Minsk in 2011 to lead his country's consulate in St Petersburg. During the two years of Shapira's work in Minsk, he achieved a breakthrough in relations between the two countries. Three Israeli ministers visited Belarus and their Belarusian counterparts paid visits to the Holy Land three times. It was Shapira who initiated long-term collaboration between experts in tourism and agriculture. He repeatedly voiced the readiness of his state to abolish the visa regime with Belarus. When Israel introduced a visa-free regime for Russia and Ukraine, the number of travelers between the countries doubled. However, words and political moves failed to transform into concrete offers. The process of abolishing the visa regime, Israeli sources admit, is made more difficult by Belarusian authorities hampering the process. According to Belstat, in 2010 the trade turnover between Belarus and Israel was merely $78m, although officials speak about a $1bn potential. Ironically, the intensity of political and economic cooperation between the two countries increased a year after a big scandal. During a press-conference on 12 October 2007 Alexander Lukashenka made the following remarks about Babruysk, a city in the central part of the country: "This is a Jewish city, and the Jews are not concerned for the place they live in. They have turned Babruysk into a pig sty. Look at Israel – I have been there." This statement was regarded as anti-Semitic all over the world. To deal with the scandal, the Belarusian ruler sent to Tel Aviv Pavel Yakubovich, the Jewish editor-in-chief of his main propaganda newspaper, Sovetskaya Belorussia. The following year the Belarusian authorities sent a very large delegation to take part in celebrations for Israel’s 60 years of independence. Why Does Lukashenka Need Israel? Belarus tries to balance itself not only between Russia and the West, but also between Israel and the Muslim world. For example, during a mysterious visit of Belarusian Prime Minister Mikhail Myasnikovich to Tel Aviv, Lukashenka had a telephone conversation with Iranian President Mahmoud Ahmadinejad, who had previously called for the destruction of the state of Israel. It is obvious that the Belarusian regime is very interested in both Israeli money and in the US-Jewish lobby stepping up Belarus-US dialogue. During the last visit of Avigdor Lieberman to Belarus in 2009, both Lukashenka and the head of his administration Uladzimir Makei publicly admitted so. Belarus’ authorities also appreciate the fact that Israel does not try to influence Belarusian politics through its minority as Poland does. Belarusian Jewish expert Wolf Rubinchyk points out that Israel has no interest in building a well-organized Jewish community in Belarus in the hope that Belarusian Jews will eventually immigrate to Israel. As a result, the numbers of the Jewish population in Belarus has been declining. In the 2009 census, only 12,900 Belarusian citizens identified themselves as Jewish. Moreover, Israel is always extremely cautious in political statements concerning the situation with human rights and democracy in Belarus. "It is important to maintain good relations with a country which treats us perfectly" said Yosef Shagal in his recent interview with Israeli ITON TV. The Israeli diplomat particularly liked that "when not voting for [Israel] in the UN, Belarus many times did not vote against [Israel], abstaining instead." New ambassador Yosef Shagal, who served in the Soviet army in Minsk in the late 1960s, has already complimented Alexander Lukashenka on being 'a strong leader'. "He has his minuses, but this is something for which he should get credit and the Belarusian people, who vote normally despite some allegations of ballot tampering, will confirm this," said Yosef Shagal who is a protégé of Avigdor Lieberman. Experts have noted a longstanding 'political sympathy' between Lukashenka and Lieberman. Since 1995, the Israeli politician has visited Belarus at least five times in different roles and on various occasions. He also played a key role in the restoration of the Israeli embassy in Minsk in 2004 which had been closed the year before for economic reasons. Some believe that Lieberman still has personal financial interests in Belarus. The 'big friend of Belarus' is now under investigation for graft, money laundering, and witness tampering. He is also accused by the Israeli police of having unauthorized access to classified documents related to criminal inquiries into his activities. Lieberman is believed to have received copies of the documents from Zeev Ben-Arieh, Israeli Ambassador to Belarus in 2005-2008. The documents sent by Israel's Justice Ministry to the Belarusian authorities contained a request to question banks and prominent figures in Belarus that could be involved in Lieberman's suspected illegal dealings. The former ambassador Ben Aryeh, who used to be a great fan and translator of Belarusian literature into Hebrew ,had to resign from the Israeli Foreign Ministry because of this. Lieberman denies all the charges. Bilateral relations between Belarus and Israel are unlikely to see any significant changes. At least, as long as both Alexander Lukashenka and Lieberman remain in their positions. Kanstantsin is a contributing author. He is a Belarusian journalist currently doing an MA in International Politics at City University in London.